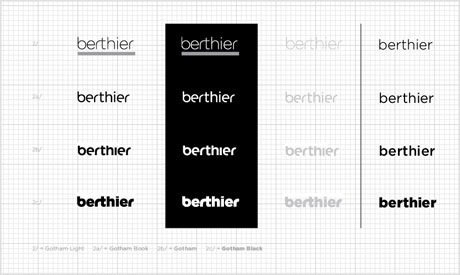 Dominique Berthier, Managing Director at Berthier Associates, approached me to redesign his company's identity. 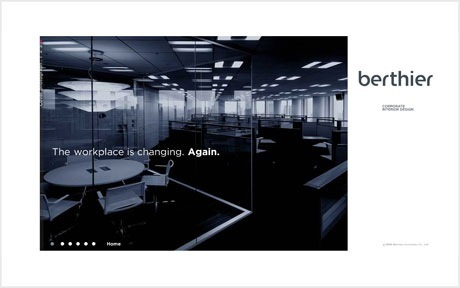 Berthier Associates Co., Ltd. was launched in 1987, specialising in the planning, design, installation and maintenance of modern workspaces. The company is based in Tokyo, but provides coverage throughout Japan, and the client list includes Air France-KLM, Ferrari, Citroen, Carrefour, Aozora Bank, Saudi Petroleum, and Vale. 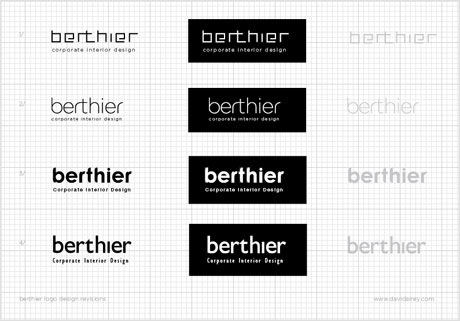 Dominique wasn't satisfied with the old Berthier logo design (below). I asked what the new identity should say about the company, and the following key words and terms were listed: fresh, attractive, livable, reliable, concern of the users, modern, innovative, flexible, on time, perfection, professional, total management, high quality, multinational, planned efficiency, conceptual, detailed, cost saving. 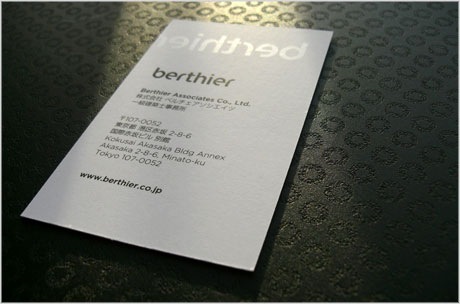 A 』simple, yet powerful' logo was called for, text only (known as a logotype), to be incorporated into a visit card design (visit cards are the Japanese equivalent of business cards). The final design needed to work as a watermark, inverted, monochrome, grey and in small sizes. I expect, on top of good taste, a flawless graphic work, with fonts carefully selected and juxtaposed … a detail — preferably genius one — should express our creativity and modernism. Overall, kindly keep in mind that our selling points are not products but solutions resulting from intellectual activities. 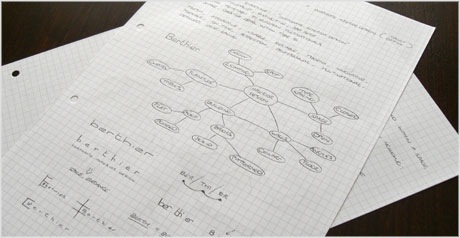 A vital part of any design project, sketches allow for a free flow of ideas, un-restricted by computers. This option (above / below) was deemed too organic, when the service offered by Berthier is more functional and precise. The following images show a little of my exploration into customised letterforms — one aim was to find the right balance to work beside Japanese Kanji (Chinese characters used in Japanese writing). 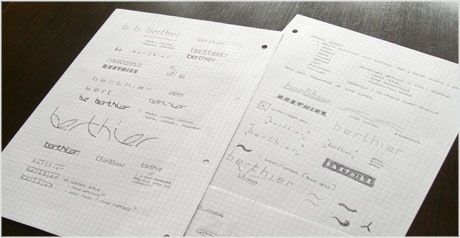 It's important to have an adaptable logo design — one that works on light or dark backgrounds. The logotype was formed by customising Gotham — a superb type design from Hoefler & Frere-Jones) — and here I highlight the individual characters that were amended. I like Gotham. It is an elemental, no-nonsense font, therefore a good match for any architectural firm. The work you did on this font has also the advantage to give it a more refreshing touch than the original. Once the logo was finalised, we began the visit card design. Dominique kindly sent some of his printed cards from Japan, which I took a few photos of (below). 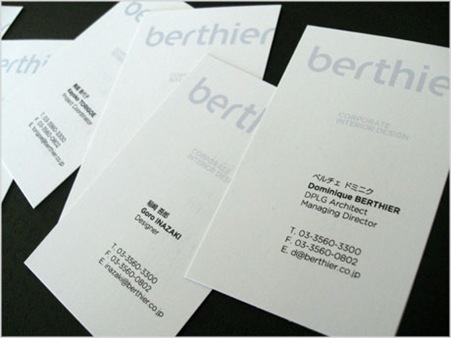 Plike was used as the card stock, which is also what my own business cards are printed on. It gives a very distinctive feel, and I was more than happy to recommend its use. You'll notice in the photo above how the Berthier logo wraps around onto the reverse side, and appears in a very subtle white ink. 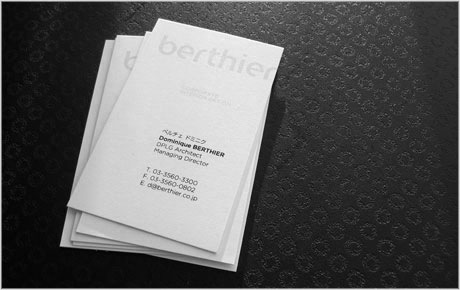 At the time of writing, the Berthier website is almost 100% Flash-based — not ideal for search engine optimisation. A new website development is in the pipeline, which I very much look forward to seeing. Dominique Berthier, Berthier Associates Co., Ltd.